Festival of the Fools celebrated in medieval France and England. Facts and picture obtained from http://blog.learningresources.com/celebrate-april-fools-day/. Everyone looks forward to the funniest day of the year, eager to pull both small and large-scale pranks on others for fun. But what was the FIRST prank from where this tradition began? Unfortunately, there is no definite answer, but the many theories available are surprisingly entertaining nonetheless! Theory #2: In Ancient Rome, the Hilaria festival was celebrated in March 25th to honor the Mother of the Gods, Cybele. The festival consisted of games, masks, jokes, and extensive partying. 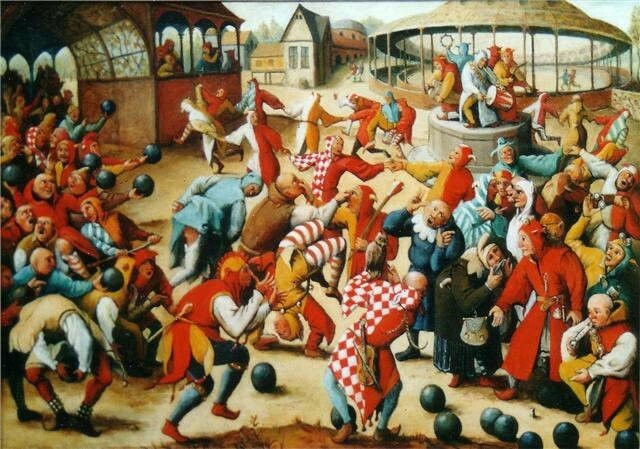 Theory #3: Celebrated in medieval England and France, the Festival of the Fools was a carnival party where people were encouraged to dress up as the opposite social class. Workers would dress as royalty and nobles would dress as peasants. However, the celebration got out of hand and was eventually banned, although people did not stop celebrating the holiday until hundreds of years later. Theory #4: During the 18th century, Scotland had a two-day tradition in which people chose who they wanted to prank and sent them on phony errands. This was called “Hunting the Gowk.” “Gowk” was a term used to describe a cuckoo bird, or a symbol for a foolish person. Theory #5: In a more scientific approach, some believe Mother Nature is the reason behind the holiday. The Vernal Equinox, or first day of Spring, can be thought of as “fooling” everyone with its wild and unpredictable weather.